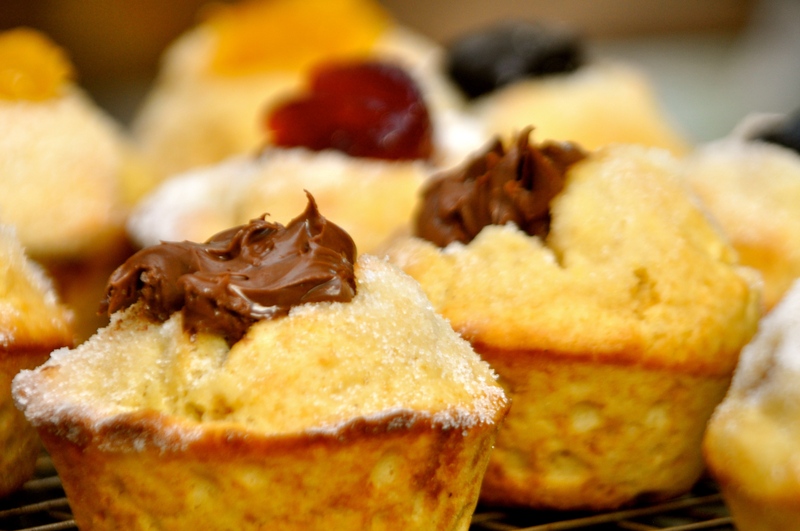 You might think it’s difficult to turn hamantaschen into muffins, but yes you can muffinize™ the traditional pastry that is served on the Jewish holiday of Purim. The classic Purim cookie is a three-cornered cookie called “hamantaschen,” which means “Haman’s Pockets” in Yiddish. The original filling was an Eastern European jam of prune or sweetened poppy seeds. In modern-day Tel Aviv and New York, hamantaschen has been modernized, with lemon, cherry, apricot, chocolate and amaretto. Now, the cookie’s being transformed yet again. 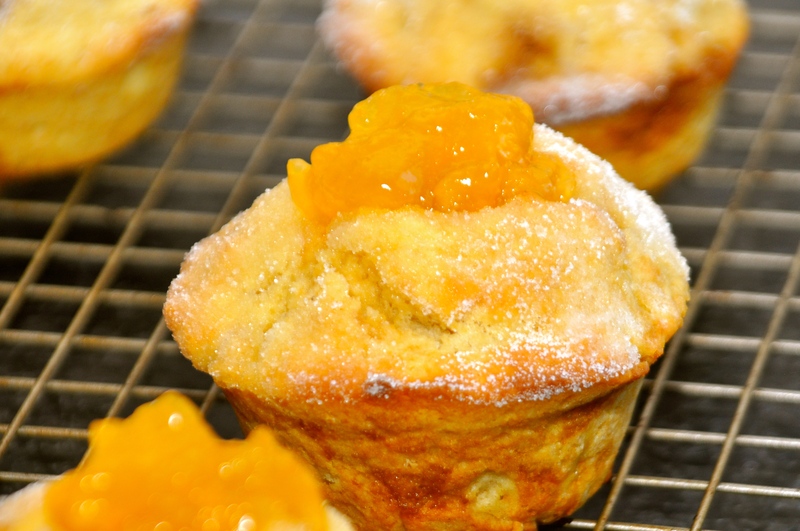 These muffins may be lacking the “three corners,” but they have pockets full of the taste of the original hamantaschen. Experiment with different fillings, or go traditional. 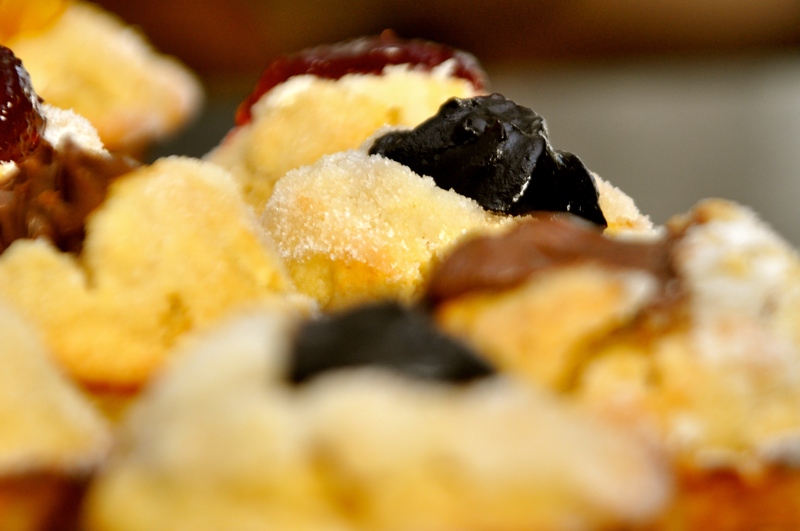 Pictured below are cherry, apricot, chocolate-hazelnut, and prune-filled hamantaschen muffins. 2. In a large mixing bowl, whisk flour, sugars, baking powder, baking soda, nutmeg and salt. 3. In a separate mixing bowl, whisk butter, oil, eggs, vanilla and milk. 4. Pour wet ingredients over dry mixture and stir until thoroughly combined. 5. 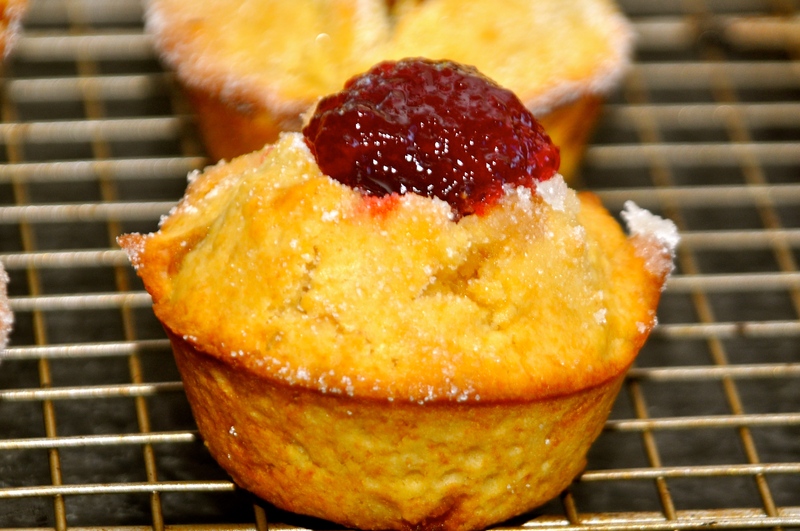 Bake for 15 minutes, until muffins are golden and tops spring back when touched lightly. 6. 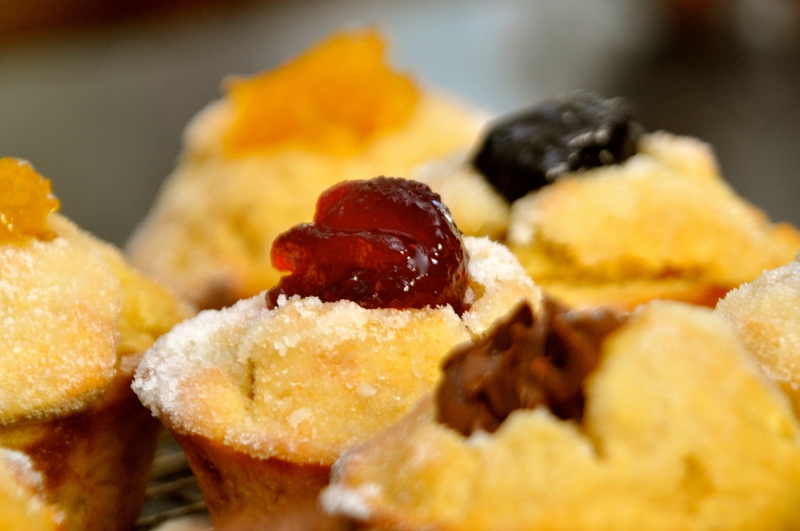 Let muffins cool for 15 minutes, then use a cupcake corer or knife to cut a hole in the top of each. 7. 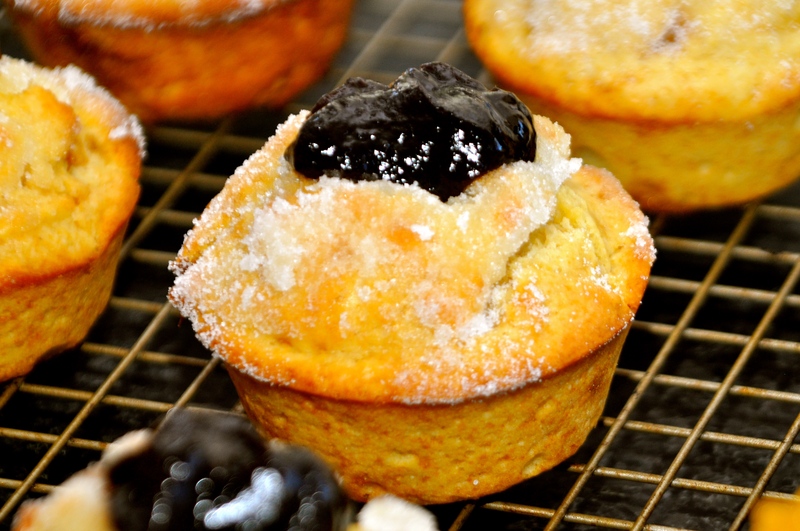 Dip each muffin in melted butter, then sugar. 8. Fill each hole with jelly. 9. 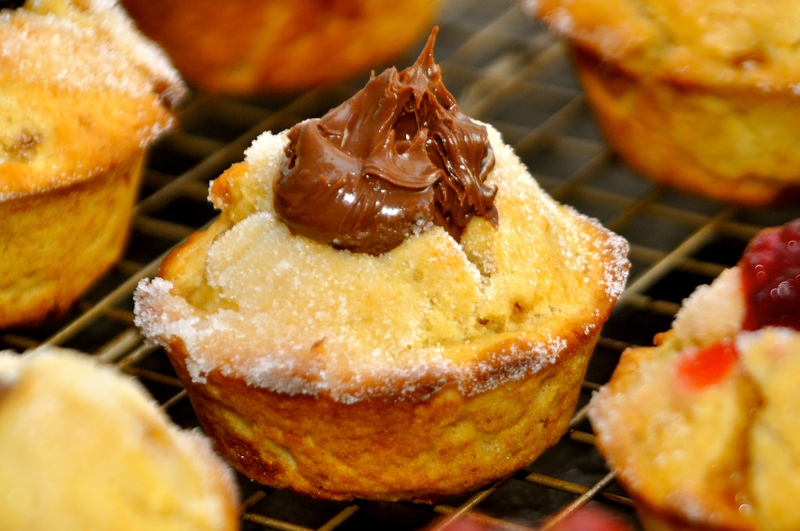 Dip cut-outs from muffins into leftover melted butter and sugar (optional).